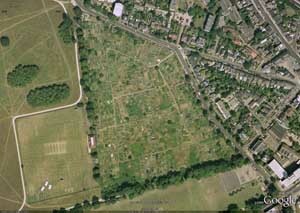 The Royal Paddocks Allotments have been on their present site for more than 80 years. The land was granted by Royal Warrant in the twelfth year of the reign of King George V, on 30th June 1921, for use as allotments by “the labouring classes of Hampton Wick and South Teddington”. Certain conditions for the use of the land were laid down: the ground should not be used for any other purpose than as allotments; no labourer should have more ground than he (sic) could cultivate himself in leisure hours; no building or structure of any description may be erected on any allotment. A Google maps aerial view photographed in 2003. The Management Committee: composed of tenants and local councilors who set the rents and liaise with outside bodies. Annual rent for the use of the land was once paid to the Master of the Horse at the Royal Mews, though this is now done through the local authority. *Most computers already have a PDF reader installed. If you do not, you may download the Adobe reader here.